Jennifer Heilakka addresses the Council of Trustees. 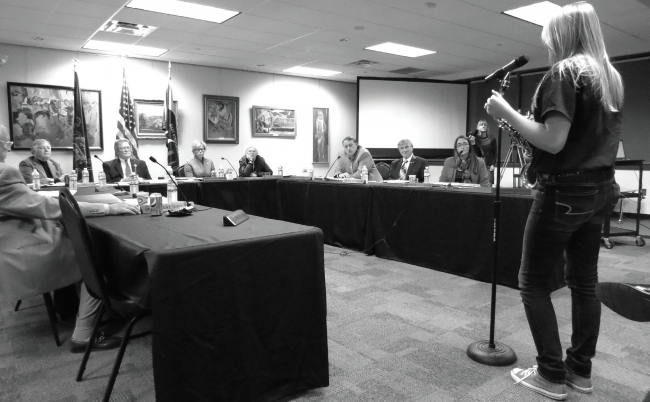 At the Council of Trustees meeting on November 5, members of the ESU student body, faculty, and community expressed their concerns regarding the recent retrenchment of the Music Department faculty and the difficulties of registering for classes for the spring semester. The moratorium of the Music Department will be complete in May 2015 and there will be no general education classes offered by the department during the upcoming spring semester. Since 2009, there has been a 17 percent reduction in faculty, which has mainly been caused by tenured faculty members retiring and their positions not being refilled. However, the Music Department currently consists of only two faculty members: Dr. Betsy Buzzelli-Clarke and Dr. James Maroney. After the department is dissolved, “we will have the distinction of being the only four-year university in the country without a Music Department,” said Laura Beimfohr, a graduate student studying biology. Dr. Maroney has served on the faculty as the director of choral and vocal activities for the past 14 years. Last December, the acappella ensemble was invited to perform at the White House. In 2011, the ensemble was invited to perform at the Fall Conference of the PA Chapter of the American Choral Directors Association. Despite a difference in majors, students expressed that they feel as though the Music Department has provided them with a new family, whether it be through involvement in choral activities or groups with instrumental focus. While students will no longer be able to take general education courses in music and receive private lessons, they are not the only group worried about the consequences of retrenchment. Members of the community are active in the concert band, jazz band, concert choir, and orchestra. “We have more community involvement than any other program on this campus every week,” said Dr. Buzzelli-Clarke. The marching band, concert band, and jazz band will continue to exist, but all other ensembles will disband with the loss of the Music Department. Cuts to the Music Department were not the only causes of concern brought to the council’s attention. Losses in faculty and staff in the Chemistry Department and the Physics Department are also causing problems for students. “During registration this year, there was a grave error resulting in a free-for-all. During priority registration, freshmen, sophomores, and juniors were able to register as well due to an error in pins. The Monday I began registering as an honors priority registration student, there was a mere eight seats remaining in Fundamentals of Physics II,” said Emily Fox, a student majoring in marine science and biology with minors in chemistry and women’s studies. “It’s very difficult to predict the impact of cuts,” said Dr. Robert Cohen, the chair of the Physics Department. As of November 5, there was only one section of Fundamental Physics II being offered in the upcoming spring semester, with 40 seats available. Two days after priority registration began, all 40 seats were occupied. According to Dr. Cohen, as of November 5 when the Council of Trustees meeting took place, there were an additional 46 students wait-listed for this course. As of November 12, this issue has not been resolved. “I think we can address this, but this shows…that we just can’t sustain the cuts,” said Dr. Cohen. Students expressed their frustrations over not being able to register for their required classes, noting concerns about not being able to graduate on time and experiencing scheduling conflicts.